» Drive electrics — or else? Drive electrics — or else? Two Chevy Volts get recharged at Linn-Benton Community College on Oct. 28. Gov. 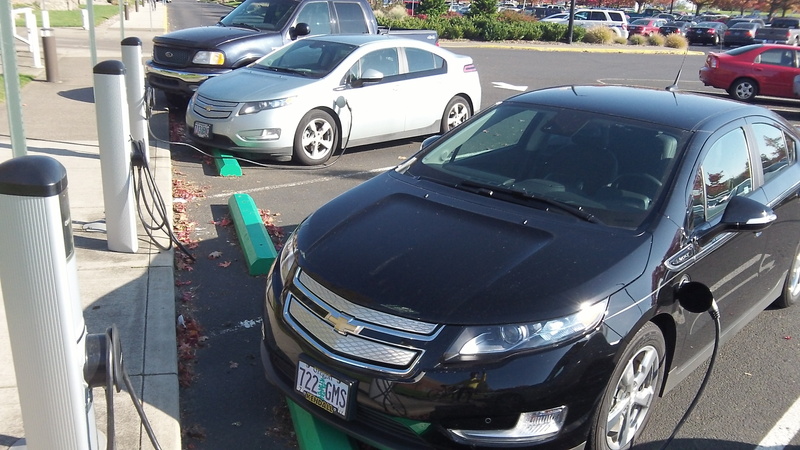 John Kitzhaber has announced that Oregon is joining California and six eastern states including New York in a “new initiative to put 3.3 million zero-emission vehicles on the road by 2025.” If this is such a great idea, why does it take government schemes to drive it forward?. It sounds as though Kitzhaber wants Oregon to spend more money — he didn’t say how much — on installing electric charging stations. If he puts that in the budget, presumably it will be up to the legislature to decide whether it’s a good use of public funds. Said the governor of this plan: “Not only will it help reduce transportation-related air pollution and greenhouse gas emissions, it also enhances our state’s energy diversity, gives Oregon consumers more options, and helps move Oregon’s 10-Year Energy Action Plan forward.” As for transportation-related air pollution, catalytic converters have almost eliminated it, and for most of Oregon air pollution is no serious problem. Energy diversity? How will using more electricity will make us more diverse? As for options, consumers have them now. Even with subsidies, most people just aren’t rich enough to buy an electric car for short trips around town because they still need conventional vehicles for longer trips. No matter how many charging stations there are, who wants to risk having to spend extra time — even half an hour at a fast-charge station — because the battery is running down? Tom LePage, on Facebook: This is typical of Democrat schemes. JK always seems to know better what’s best and never hesitates to make everybody else pay for it. Rich Kellum: Where does the power come from for those electric cars? In Albany, it is from COAL. We have PP&L. Most of the power they produce comes from the east and it is from coal plants. So If you drive a Prius, it is from that nasty oil stuff, and if it is a Volt that you drive, you have a cloud of carcinogen-making, baby-killing, coal train-enhancing, oh my god it will kill us all coal dust-fluffing, carbon dioxide-making coal power plants. Gee, maybe I went overboard. Isn’t sarcasm wonderful?